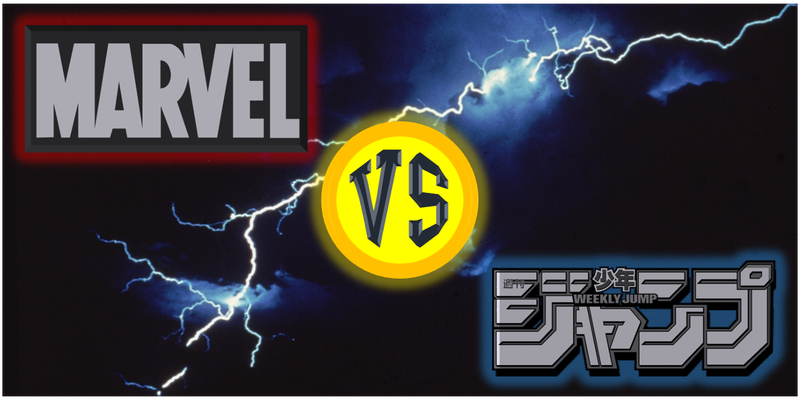 Marvel vs. Shonen Jump: The Ultimate Duke Out! Filed to: VS.Filed to: VS. It's time! Marvel, a powerhouse in the west and full of recognizable superheroes like Spider-Man, the X-Men and the Hulk. Shonen Jump, a powerhouse in the east with many heroes (because we can't use superheroes because of copyright) like Goku, Naruto and Luffy. One thing I noticed with the Marvel Cinematic Universe is that many of the films feel similar to how a lot of the Shonen Jump films by Toei, especially the Thor series, Iron Man 3 and Guardians of the Galaxy. From the themes, the villains and even down to the basic plots. I actually made a similar list a while ago about DC vs. Shonen Jump, mostly because I noticed a lot of the versus out there are based around several characters from the two, most particularly Superman vs. Goku. However, given the similarity between the two and just the fact that I want to do this list, what would happen if Heroes from the two duke it out? Who would win? Who would Lose? Please feel free to disagree and make your own duke outs and your own thoughts on who would win. The Hulk: In his frail civilian form of Bruce Banner, he is a former scientist who is fleeing from the US government But as the Hulk, he is considered an unstoppable force of rage, destroying entire cities if provoked. Naruto: A member of the secret Leaf village and with the mystical nine tailed fox within his body, he is a master ninja with many different powerful abilities and is able to transform into a powerful bestial form. Personal Outcome: It is a long, destructive battle with both having to use there full power to even has something of an edge. Naruto, using his 7 tailed form, nearly beats the hulk. But Hulk in a last ditch attempt of rage punches Naruto out cold. Now in his human form, Bruce takes Naruto to the closest Doctor and slinks off as a lonely man. Iron Man: Tony Stark, billionaire and Genius once found himself captured by a malicious group and trapped in a metal suit of his own design. Though free of his constraints, he fights crime in hugely powerful suits that are capable of flight, great endurance and force projectiles. But, he also suffers from depression and alcoholism. Arale: Built by the robotic genius Senbei Norimaki with the design of a little girl. Arale is one massively powerful robot with amazing strength and speed. Personal Outcome: Tony will underestimate Arale until it is too late. Arale with a child-like charm, beats up Stark, crushing his balls and sending him flying all the way to Gibraltar. Wasp: Though originally the sidekick to Ant-Man, Wasp quickly became superior to the pathetic Ant-Man who beat her once (seriously why is he getting a film first?). Her ability to shrink, her speed, her brilliant espionage and leadership skills makes her a force to be reckon with. Pegasus Seiya: Orphaned as a child and trained to be a Bronze Saint, Seiya is peak of physical fitness and capable of powerful energy strikes. Something he'll need to win the Galaxian War. Personal outcome: Though this may seem to be an incredibly one sided fight at first. However, the Wasp's ability to shrink and great speed make Seiya waste massive amounts of energy. As Seiya weakens, Wasp takes pot shots at Seiya until Seiya gets one good direct hit, finishing the fight instantly. Ghost Rider: After making a deal with the Arch demon Mephisto, Johnny Blaze has become the spirit of vengeance known as Ghost Rider. A dark being with the powers of necromancy and can use hellfire. If you are bad and are judged guilty, your soul is obliterated. Dark Yugi: Dark Yugi (known as Yami in the English Dubs) is the twisted soul within the Millennium puzzle. Known as the king of games, he is a master of every game known to man and is also capable of making his own, usually lethal games known as the Yami No Game. If you have been bad and he challenges you to a Yami No Game, pray to god you win (which is nearly impossible) because if you don't, your best case scenario is that he kills you. Personal outcome: Ghost Rider forces little Yugi into a corner. However, once Dark Yugi takes over and challanges the rider to a Yami No Game, the tide quickly change. The Rider loses and Dark Yugi and is sent to a realm of shadows, where he will suffer and tortured for all eternity. Dark Yugi, with a large sadistic smile leave, maybe Joey is up for a duel? Deadpool: The merc with a mouth. Wade Wilson was once Weapon X, a program to make him the ultimate warrior. However, it made him completely unstable but gave him the realization that he is just a comic-book character. Kenshin: A wandering swordsman, he wields a back blade so he can never kill again after bringing a new age to Japan. That isn't to say he is no push over. He is a master swordsman and is capable to taking out an army of samurai. Personal outcome: The two would have a serious and long fight, both using all the abilities in their arsenal. Ultimately though, Deadpool will beat Kenshin by literately using him to break the fourth wall. Captain America: A superhero and an icon to the United States during WW2. Captain America, real name Steve Rogers is a natural born leader and is capable of great feats of agilty and strength. He also has his mighty shield which enemies will yield to. He also kills Nazis, nuff said. Yoh: Yoh is well known of being a slacker who cares for a peaceful existence. He is also a born leader, courageous, master of combat and is capable of many energy attacks. Personal outcome: Yoh and America have a great clean fight and ends only when the two can't keep on going. However, even with all his power, Captain America collapses first, Yoh winning by default before collapsing himself. Wolverine: How old is he? Who is he? Why does he have claws? These are questions even he can't answer. Wolverine, known as Logan is a rogue member of the X-Men with a healing factor and will kill you if you deserve it. Kenshiro: Considered a guardian and a protector to many in the ashes of earth after the third world war. He is a honorable warrior, saving innocents and taking down evil doers and tyrants. Personal outcome: Wolverine wins due to his healing ability and metal claws, but that doesn't mean who gets that victory easily. Kenshiro fights to the bitter end and Wolverine, seeing him as a honorable man, spares him and gives him some advice. Black Widow: A former KGB agent, Black Widow is considered the best spy in the world and is known to be a top agent of the organization known as SHIELD. She is also the leader of her own superhero team, the Champions, she is a perfect shot. Gintoki Sakata: A mercenary for hire, he will do any task for the right price. Though trained in many forms of combat, he is not afraid to use deception to win and can become violent if left without getting his daily dose of sugar. Personal outcome: This is probably the shortest of all the fights. Sakata will try to trick Widow, only to discover she saw right through it and she kills him instantly with a shot to the head. Ichigo Kurosaki: Since he was a kid, he could see ghosts. When he became a teenager, he became an agent of the Shinigami and soon becomes a powerful warrior. Unlike others, he doesn't have any real endgame, nothing to achieve. All he cares about is protecting those he loves. Personal outcome: It is a long bloody fight, with neither giving in. Blade ultimately is defeated, however Ichigo does not kill him or takes his soul, an action he may live to regret. Yusuke Urameshi: He is dead, killed at the age of 14 in a car crash. However, unlike many spirits, he does not waste his time haunting and instead becomes a spirit detective, protecting the earth from the demon who wish to conquer it. Personal outcome: Being dead, Yusuke has the advantage. But Carol is able to use her energy absorption power to take the win. The two leave on good terms, with it likely the two will meet up again. Spider-Man: Many have taken up the title of the Spider, From Gwen Stacy, Miles Morales and the original Peter Parker. All are capable of Spider like abilities such as wall crawling and web slinging. For the sake of this fight, we'll be using Peter Parker. Monkey D. Luffy: His entire body is made of rubber and he is the captain of the straw hats. Despite his naive behavior, he is a incredibly competent and shown to be a great leader. Personal outcome: As the fight starts out at sea, Luffy is in his element, able to take out Spidey easily with only his intelligence saving him from a final blow. However, once the battle hits the streets, Spider-Man is quickly able to out smart Luffy, using tricks and clever tactics to eventually take him down. Thor: Dr Donald Blake, a crippled scientist finds the legendary weapon of Mjolnir and gains the power of Thor. Or he is the actual Norse god of Thunder. In either case, he is amazingly strong and is capable taking down the most powerful of gods. Goku: Starting life as the weakest of his race, Goku slowly rises to become one of the most powerful beings in the universe. He is caring, is very honorable and cares most for the simple things in life... and fighting. Personal outcome: Planets are destroyed, energy blasts with the force of suns are fired and punches that would make a normal person explode are thrown. It is a literal battle of the gods with neither backing down. However, Goku in one final super Kamehameha, takes out Thor with Goku taking the hammer and gains its power.